Roger Vivier at his studio in 1953 a week before the coronation of Queen Elizabeth II, designing her gold kidskin sandals studded with rubies. Selection of pullover shoes designed by Roger Vivier for the house of Dior, 1958-1962. 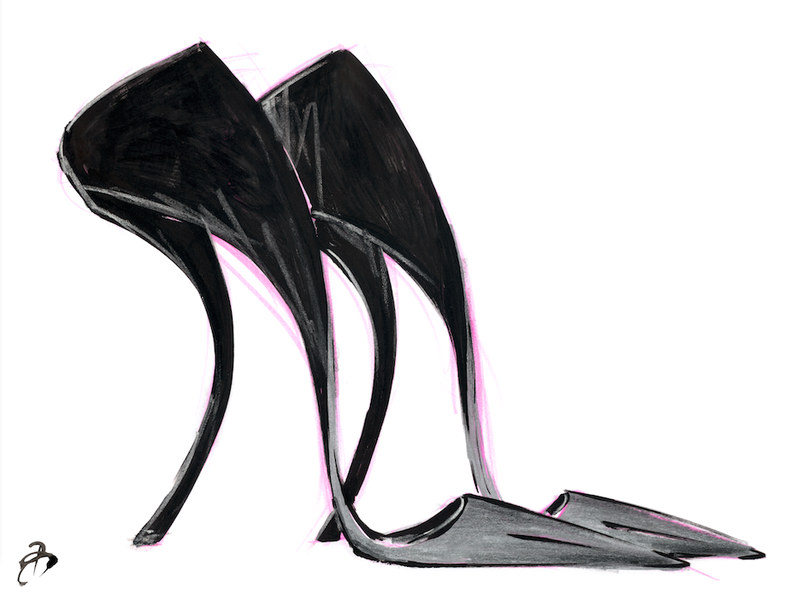 Bruno Frisoni’s sketch for the higher comma heel from Limited Edition Rendez Vous Fall-Winter 2013-2014. In his heyday, Roger Vivier’s creations were dubbed the ‘Fabergé of footwear’ – which is practically an understatement to describe French inventor’s stiletto heel—the very shoe that Elizabeth Taylor, Marlene Dietrich, Ava Gardner, and even the Queen of England wore. After some rocky years following Vivier’s death in 1998, the house is now celebrating the tenth anniversary of its relaunch under the creative direction of Bruno Frisoni and the chaperoning of extraordinaire Frenchwoman Inès de la Fressange. Today, the team has survived a most frightening challenge – the near impossible bet of honoring and perpetuating, yet reinventing, one of the country’s most legendary brands. The warm reception of Frisoni’s lively, chimerical creations prove there is still room for reveries and playfulness in a blasé, saturated market. To celebrate the event, the house has launched a book that is one-part family photo album, one-part moodboard. “The idea was to do a lively, welcoming scrapbook-style book with a collage feel, filled with special guests that are close to us,” says Frisoni about the large tome that presents collaborations of company friends including Kate Blanchet, Virginie Mouzat of Vanity Fair France and Olivier Saillard, the fashion historian heading the national fashion museum Musée Galliera. “Humor and fantasy are still key to the house,” he says about the bright, informal tone of the book. Over the years, Frisoni has been combining his thorough understanding of the job with a whimsical imagination and deep attention to women’s changing needs—a recipe that has proved successful in revivifying the Vivier brand. Frisoni’s impressive background includes work for Christian Lacroix, Yves Saint Laurent, and Givenchy; arguably, his arrival at Vivier marked the pinnacle of a mature yet utopian approach to the job. He rapidly created pieces that were successful in keeping with Vivier’s most iconic designs: Frisoni’s spiky ‘Horn Heel’ would certainly make the legendary curved ‘Comma Heel’ blush with pride. Like Vivier in the 60s, Frisoni is well aware that the women he designs for are faced with ever-changing social norms. And while the former designed short stilettos aimed at the 60s generation—notably seen on Catherine Deneuve’s feet in Belle de Jour—one of Vivier’s successes today is Freesange’s favorite buckle ballerina flat. “Women today know they don’t always need an extra 12 centimeters to be hot,” she says, giggling. “Women used to get changed several times a day. Today, a woman keeps one outfit on yet leads a million lives over a day. Basically, she wants to look great round the clock, but without the hassle,” explains Frisoni. His heels are growing increasingly sturdy—yet invisibly so— and more flats are on offer. The house has also developed plenty of handbags that are increasingly becoming part of their new and improved DNA, fit for an economy in recession with a consumer base still desiring quality. “We’re an ancient house but a new enterprise, so there is the excitement of novelty here at Vivier,” says Fressange, who recommends humor to ice-cold elegance. A fine example of her conviction in action was the opening of the brand’s flagship boutique in Paris’ 1st arrondissement: Fressange swapped the obligatory red carpet for a long strip of zebra print; limousines were replaced by New York cabs or London buses; and the guest list included the Queen of England’s lookalike. “The book, the boutique, the life of the brand needs to be effortless and gay,” she adds. Today, many houses have followed the trend, including Carven or Rodier. The difficulty of finding a designer suitable for Schiaparelli further proves the tour de force of Roger Vivier. “Some products are cult and are celebrated across generations such as trench coats or Kelly bags. The best we can hope for is to offer creations both timeless and very much of today,” Frissoni adds. All images courtesy Roger Vivier and copyright Roger Vivier, Rizzoli New York, 2013.